To spice up the Epox 8K5A2+ motherboard and differentiate itself from the older 8K3A+ Epox has done a few clever things. As with MSI and their KT3 Ultra2-BR, Epox is shipping this motherboard with Bluetooth peripherals. The small module to the left contains the CSR Bluetooth chip and related circuitry, all in a space of less than 24mm x 14mm. More on this in a bit though as the Epox 8K5A2+ has a few other features worth mentioning right away. The most significant of which is native USB 2.0 support thanks to the new VIA VT8235 southbridge. 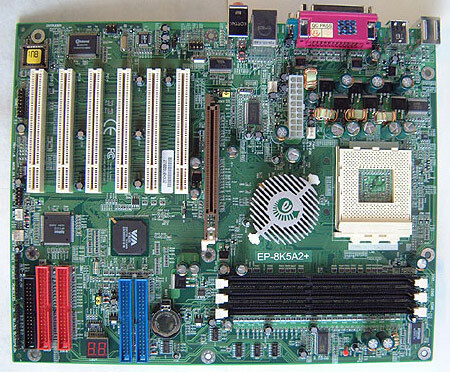 Other features on the board include a software based onboard 5.1 audio codec, 10/100 Ethernet LAN, UDMA 133 IDE RAID, a full six PCI slots, 4x AGP and three DIMM slots supporting up to 3GB of PC1600/2100/2700 DDR RAM. Epox has been using the same general motherboard layout for the last few releases and it has served them quite well. Even though the 8K5A2+ still uses a passive cooler on the KT333 Northbridge, at least it's attached with clips instead of tape like the Epox 8K3A+. Some sort of active cooling on the KT333 chipset would have been an nice extra since it can get quite warm. With so many devices integrated onto the PCB, it's great that Epox was still able to squeeze in a full compliment of six PCI slots. With so many PCI's you're not going to run out of upgrade options any time soon, and that is good for the lifespan of you purchase! Looking at the back of the motherboard, we can see that the "overclocking strips" that were on the back of both the 8KHA+ and 8K3A+ are now gone. Does that mean overclocking performance on the Epox 8k5A2+ won't be as good...?